How do you tell who’s a he and who’s a she? It’s up to the reader. Refer to panel 3, etc. Your photo makes that comment even better. I totally get that. 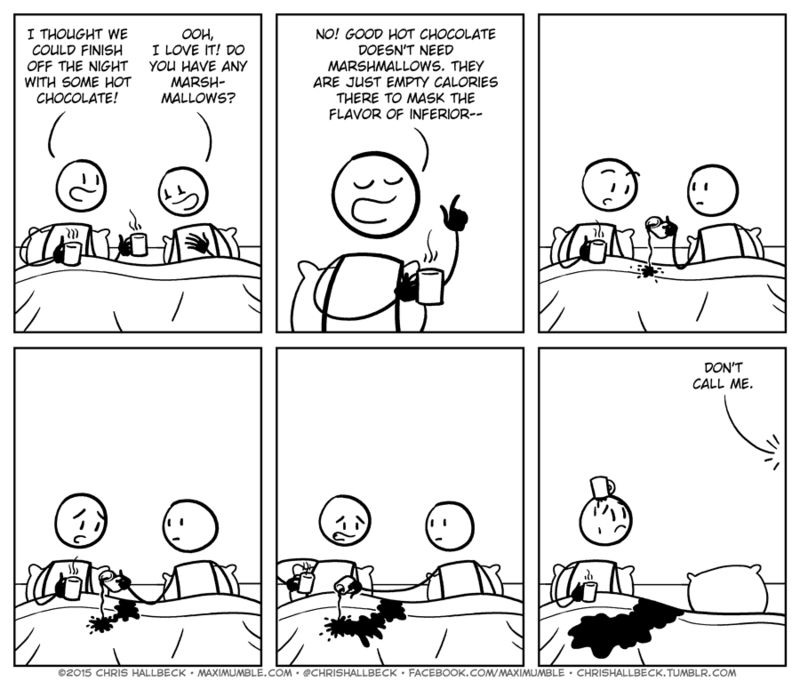 Marshmallows, ugh. When the lady asks for marshmallows, you get her marshmallows. When the man asks for marshmallows, you tell him to go get his own. I think this is one of the times where I love that it’s gender neutral, because both of them could be negative stereotypes of both. Hot chocolate without marshmallows? That’s just wrong! Whipped cream, however, is an acceptable substitute. Why would ANYONE corrupt rich creamy chocolate, sugar and milk with cheap whipped corn syrup and gelatine? Good hot chocolate doesn’t need marshmallows like a good cheeseburger doesn’t need bacon. Perfect use of a double length comic.